New to Solos! Our resort is located directly in the Großglockner, a large ski area in East Tyrol known locally as Osttirol. You'll be impressed by the excellent slope conditions and breathtaking panoramas at 3,000 metre high summits. More than 37km of slopes, ranging from easy to intermediate, await us here. With around 37km of ski runs, the Großglockner Resort is the largest ski resort in East Tyrol. The slopes are well prepared with ski runs that drop down to both of the towns of Kals and Matrei. Modern lifts and gondolas provide a comfortable journey to the top, and generous beginner areas in both Kals and Matrei promise fantastic conditions for beginners and more advanced skiers. The majority of the ski area is equipped with snow-making machines, guaranteeing great conditions all season. 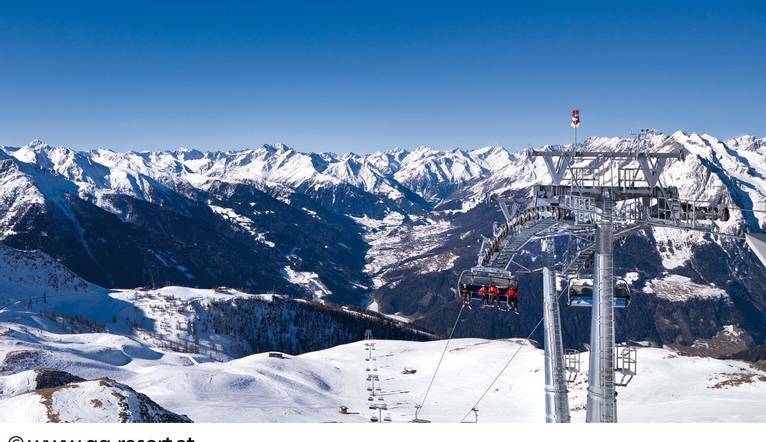 Located close to the slopes and cable car, our hotel is in the resort of Matrei in East Tyrol. A 20 minute walk takes you to the Matrei ski resort, and the hotel has a bus stop outside which offers a free shuttle for a day on the slopes. This traditional yet modern hotel is located in Matrei with the resort centre a short walk away. It provides a comfortable base to enjoy what this ski resort has to offer. Facilities include a restaurant, bar and lounge, as well as an indoor swimming pool and spa area with a sauna and steam bath. Free WiFi is available in the hotel and there is a ski storage room as well as separate boot drying. There is also a free ski bus (subject to having a valid ski pass) that stops right in front of the hotel and will take you to the valley station of the Großglockner resort in just a few minutes. Single rooms feature a hairdryer, telephone and satellite TV. Poor piste conditions can be hazardous to ski equipment as uncovered rocks and stones can easily scratch and damage skis and snowboards. We strongly recommend you inspect your ski hire equipment at the start of your holiday and agree the state of their condition with the ski hire suppliers, as clients are responsible for the care of their hired equipment. Should this equipment be damaged, the ski hire suppliers are within their rights to ask for a compensation payment. This can be hired in the resort where you will be advised about the most suitable equipment for your standard of skiing. It is very important to have ski boots that are comfortable and fit well, so don't be afraid to keep going back and changing your boots until you get a good fit. For your safety, we advise that you wear a ski helmet wherever possible. On a skiing holiday, dress is generally very informal, the emphasis being on comfort and warmth. We recommend that you pack a pair of skiing trousers and warm ski jacket or a waterproof shell and separate fleece lining or an all-in-one ski suit. Thermal or silk underwear is recommended. Pack cotton/cotton mix roll necks, t-shirts or sweat shirts; several thin layers are better than one thick layer. Ski socks, ski gloves or mitts and a hat or headband are suggested. Where temperatures are expected to be well below zero, take a facemask or balaclava. Moon boots or waterproof walking shoes are a “must”. Sun-cream (high protective factor), lip salve, sunglasses and/or goggles are all very useful items to pack. Casual clothes are ideal for the evenings; it is unusual on skiing holidays to dress formally in the evenings.